Eaglescreech falls in the same classification of the majority of his family. A sturdy muscular frame that is supported by long limbs giving him that lanky look. Every hair on his pelt is long and sleek protecting him from even the coldest of temperatures during leaf-bare but also allowing him to become rather uncomfortable on extremely hot days. His fur mainly consists of a light brown with darker brown or black stripes racing throughout it from the tip of his nose to the tip of his tail. An exception to that coloration is the frost that was sprayed on his muzzle down and across his underbelly. His dazzling bright azure eyes complete his appearance. 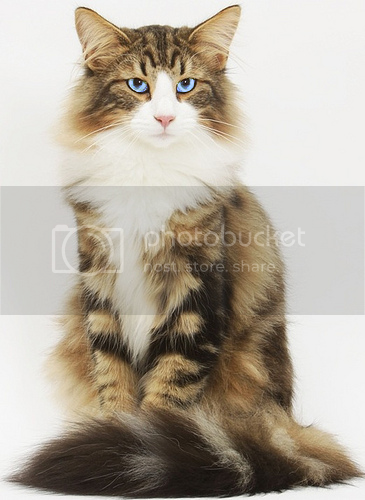 Long furred, dark brown tabby tom with a white splash on his chest and blue eyes. This dark ball of fluff has always had some sort of obstruction in his path since he was born. Due to his mothers favoritism Eaglekit feels the encouragement to surpass his siblings in anyway he can. As a kit and apprentice he is constantly boasting about how he will become the best and eventually leader. This ambition ignites a inner flame within the tom that pushes him to do his best every time and pushes him to rapidly learn to fight and hunt. He will stop at nothing until he gains his mothers favor, even if he has to sabotage his opponents. Being constantly compared to his older brothers while pushes him can also spark anger which is where he isn't opposed to strategically placing thorns in his siblings nests or usual trodden paths, or trying to make them look like a fool if sparing in front of others, and hopefully his mother. Born in a second litter to the proud Morningfrost and Peregrinewing Eaglekit was born alongside his littermate Dawnkit. While Peregrinewing seemed to love all of his kits equally, Morningfrost loved only those she favorited. Even in his few moons he has picked up the his siblings Harestrike and Thrushwhisker are already her known favorites, While Larkfeather is more or less never mentioned. Determined not to be forgotten or forever in his siblings shadows Eaglekit dedicates his time practicing with his littermate Dawnkit, who he would claim isn't a threat to the status of mother's favorite. While he looks up to his older siblings he can't wait for the moons to come where he can outshine them both. After all, Eagle's are superior to hares, thrushes, and larks. Meaning he is destined to be the greatest cat in his family. Staff Note: 20 Prey Awarded for the June Promo!